Nothing says pizzazz like a winning smile! 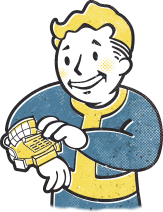 Charm your way out of any situation with this pin perk courtesy of FiGPiN and Vault-Tec Industries. Download the FiGPiN App from the iOS and Google Play Stores and unlock your pin with the engraved serial number. With each pin unlock you can earn points toward future FiGPiN releases and track your awesome collection of FiGPiNs!